When I learned in 2000 that Mum had been diagnosed as having Alzheimer’s, or probable Alzheimer’s, I remember I was shocked and, although I knew little about the disease, I was aware it was bad news. I hadn’t encountered Alzheimer’s before and it was little talked about back then. It is hard to comprehend this now as it is in the news nearly every day and more and more people are being affected by it and are aware of its devastating effects. Although Alzheimer’s is talked about now, in my experience many of the attitudes surrounding it have not changed. I didn’t realise that once this diagnosis had been given it was the start of a long and complex journey with many stages. Should I have known this? Do others know what lies ahead? 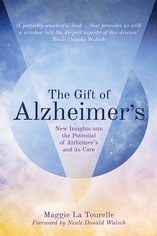 When I give talks about, The Gift of Alzheimer’s, I am surprised at how many people don’t know. The information is available. Why is there such ignorance about the process? Like many family members nowadays I was not living near my parents. I was living in London and my parents were in Scotland. Dad was in his nineties and was not able to cope with the difficulties that were arising daily with my mother. My sister, who had been living locally, had died the year before. So the responsibility to deal with everything fell upon me. I made a conscious decision to maintain my life in London, but to make my parents my top priority and organised my life accordingly. I soon discovered that caring at a distance was not easy and my visits to Scotland to deal with the deteriorating situation became more and more frequent. No sooner was I back in London, having set up what I thought were adequate arrangements, than new problems arose that required me to go back up again. It was like a never-ending game of catch-up. I was so busy trying to manage my ‘double life’ I didn’t have time stop to find out more about Alzheimer’s. Is this the same for you? I realise now it would have been really helpful if I had had some idea of the bigger picture. Do you want to know the BIG picture? Do you want to know it now? Do you have the resources to find out? If you are an elderly carer you may not be IT literate so may not have access to on-line information. If you are a son or daughter you may, like me, be so busy to have time to stop and find out. Or, like friends of mine, finding it too painful witnessing a parent suffering from Alzheimer’s, you may choose not to know, preferring to let things unfold in their own time. It takes a brave soul to face the realities of Alzheimer’s, but having this information about the big picture I believe is reassuring and helpful in the long run. It will give you some idea of what to expect so you will not be taken unaware. It will also enable you to plan ahead and feel more in control of the ever-changing situation. There are seven stages in Alzheimer’s and each stage is defined by a set of symptoms and behaviours. Of course this varies from person to person but knowing these stages can give you a rough idea of the stage your loved one is at and what you can expect to follow. It also gives approximate time frames that can relieve the kind of distress that I experienced when Mum was talking about dying in the next day or so, and I believed her, when in reality she was likely to live much longer. Looking forward to the next stage of our journey together.